Offer this mask to your male clients. 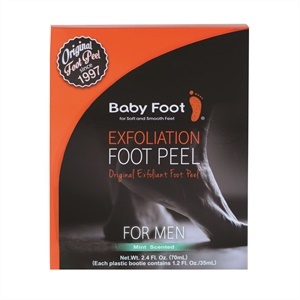 The popular foot exfoliation brand Baby Foot recently introduced a new addition to their line, the Baby Foot Exfoliation Foot Peel For Men. This one-hour treatment contains 16 natural extracts, and glycolic and lactic acids, which are all meant to gently remove unwanted dead skin cells in a simple and effective way. The men’s booties feature a fresh mint scent and will fit up to a men’s size 14, which will be a useful tool to persuade larger-sized male clients to try this as an add-on service. For more information, go to www.babyfoot.com.